May peace and prayers be upon Prophet Muhammad and his family. 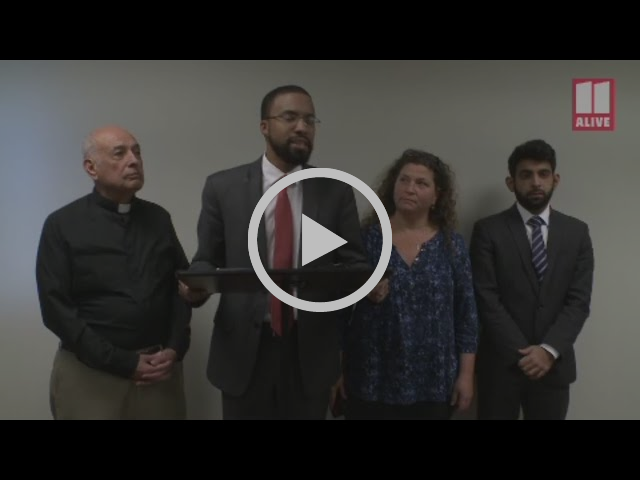 Yesterday afternoon, CAIR Georgia hosted a press conference to rebut bigoted attacks on Palestinian-American students who celebrated Palestinian history during a multicultural event at a middle school in Alpharetta last week. See below to watch video footage of the press conference, read a summary of our position, or read news reports about the situation from local media outlets by visiting The Atlanta Journal Constitution, 11 Alive or The Atlanta Jewish Times. CAIR Georgia, Jewish Voice for Peace, and Palestinian Christian leaders hold a press conference in response to controversy about a Palestinian cultural exhibit at Autrey Mill Middle School. As we discussed in the press conference, Palestinian-American students and their families have participated in the multicultural event over the past two years by arranging a popular exhibit featuring Palestinian cuisine, Palestinian flags, and a map of historic Palestine, among other symbols of Palestinian culture. School officials approved, visited, and praised this exhibit both this year and last year. However, the school feigned ignorance and condemned the very same exhibit after criticism from some pro-Israel advocates and media attention. The school also pledged to track down and punish whoever arranged the exhibit even though the school approved the exhibit, as well as a similar exhibit about Israel in a prior year. During our press conference, we released clarifying information about the Palestine exhibit, condemned the school's improper handling of the situation, called on school officials to protect Palestinian and Muslim students from bullying, and offered to arrange a meeting between those students, their families, and school officials, as well as concerned community members. Alhamdulillah, we are happy to report that the school district did not dispute any of the information we released during our press conference yesterday, has agreed to meet with us, and has not taken any action against the students or their families. We will keep you posted on new developments, God willing. In the meantime, and as always, please let us know if you, your friends, or your family experience anti-Muslim bigotry, whether at school, the workplace, or anywhere else.